Baylor University Medical Center at Dallas has announced a second woman in the U.S. who was born without a uterus has given birth to a baby, thanks to a uterus transplant. The center who performed the first birth via uterus transplant late last year, did not reveal the identity of the mother, only saying the pregnancy and birth were uncomplicated. The University of Gothenburg in Sweden was first to acheive success with these transplants. In 2014, they welcomed the very first baby to ever be born after a uterus transplant and have repeated their procedure and success eight more times. Now they’re sharing their science with the rest of the world. The Baylor University Medical Center in Dallas has now had two successful transplant births. 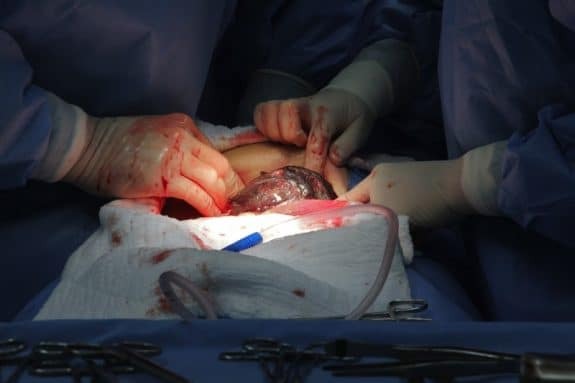 The mom in this trial was transplanted with a uterus from a living donor who is likely a relative such as a mom or sister. Researchers hope these experimental procedures may soon be able to provide another option for families dealing with AUI, including women who have had their uterus removed for medical reasons like cancer. Most of the women in Baylor’s trial moved to the Dallas area to participate in the study. Once they receive a uterus transplant, the women normally acheive menstruation within four weeks. If the transplant is successful, doctors will then attempt in vitro fertilization (IVF). Because uterus transplants are still experimental, Baylor is currently covering the procedures. It is estimated the procedure costs $500,000. It’s unclear if insurance companies will cover the procedure when it becomes more widely available.